HENK VAN BEMMELEN lives by the motto, "Love what you do and do what you love. He says that you must have a passion for the work that you do. The morning that you get out of bed and don't want to go to work is when you need to look for another career." This motto has guided his long career in the industry. Van Bemmelen says that he is passionate about working in the security industry, which is his life. This passion is in part motivated by his enjoyment of giving back to the community. "I have always been community minded. When I was small, I wanted to be a fireman. I joined a security company straight after I left the defence force and I have never looked back. I started as a reaction officer and loved the work involved as crime is an overall concern in South Africa. It is in my blood, 28 years later and I am still doing security work." 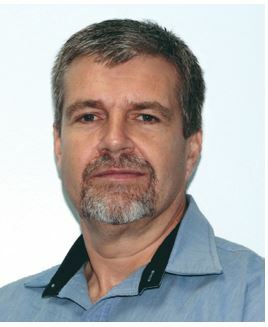 Van Bemmelen has grown through the business and worked his way up through the ranks to his current position as managing director of Blue Security. Another part of his inspiration may be found in his interest in technology and particularly the valuable role that new security technology plays in getting ahead of criminals. Van Bemmelen said, "Today's security companies are not reliant on driving around areas waiting to react to criminal activity but are now proactive in their approach." Through the use of technology, Blue Security has adopted an intelligent "proactive policing" strategy to fight crime. Van Bemmelen said the company had harnessed smart security technology to fight crime with services such as its Blue Security Mobile app, Eye-in-the-Sky CCTV street surveillance cameras as well as smart home and business alarm systems. In addition, Blue Security uses number plate recognition systems through its 'lollipop cameras', which allows the movement of vehicles within an area to be monitored. Therefore, vehicles that are not normally present in the area can be monitored and assessed for any unusual behaviour. In addition, working in tandem with the South African Police Force, stolen cars can be identified and impounded. "Through artificial intelligence, we are also working towards installing a facial recognition system, which will change the way in which we monitor areas," says Van Bemmelen. He added that technology that is currently available allows you to control the security in your home from anywhere in the world. Gates and doors can be unlocked or locked as required. CCTV cameras enable homeowners to monitor what is happening in their homes at any time, which is especially useful if an alarm is activated. These cameras may also be linked to security control rooms to ensure ongoing monitoring where and when necessary. "Blue Security has heavily invested in research and development to realise the implementation of these top end technologies to improve the security for our residential and business customers," said Van Bemmelen. He added, "We regularly analyse crime statistics and use technology to make sure our armed response presence on the ground is backed up by intelligence so that additional vehicles can be added to areas if we detect a spike in crime. We also invest in communities by sponsoring additional assistance and working closely with residents to secure neighbourhoods." "Blue Security's strong presence of armed response vehicles on the ground and use of the latest security technology has given the company the edge to fight crime smarter to keep communities safe. I am very excited about all the various aspects of new security advances that are happening," says Van Bemmelen. Part of Van Bemmelen's main function is to steer the Blue Security 'ship' and his team of approximately 600 employees that report to him. He commented, "The business runs 24 hours a day and even with a good management team its takes hard work to ensure that the business is steered in the right direction. I like to get involved and I have an awesome team that works well together. It is really important to stay focused and take care of my staff as they make the business work. We all know what we want, and we can make it happen." When not at work, Van Bemmelen spends much time at the gym as he says that it is important to stay fit and to keep healthy. He is a family man who enjoys the strong support of his family, who understand his passion for his work. His three children have grown up and left home and he has one grandchild who he says is a "blessing of note". Another of Van Bemmelen's loves is his motorbike. He and his wife have toured South Africa on this and covered many thousands of kilometres together. He says that he is delighted that his wife shares this enjoyment of the open road with him.